Fusarium wilt (fyoo-zair-ee-uhm) is a disease caused by a fungus, Fusarium oxysporum f. sp. Lycopersici, which lives in the soil. 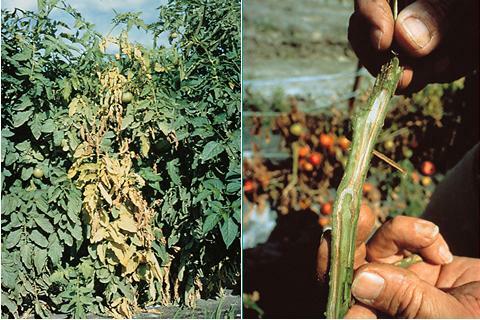 It is often confused with verticillium wilt because both produce similar symptoms in tomatoes. The fungus works its way up through the plant’s roots, clogging water-conducting tissue in the stem. That prevents water from reaching branches and leaves, starving the plant. Affected plants produce very few tomatoes. Often, the entire plant dies. What does fusarium wilt look like? First signs are yellowing and wilting on one side of the plant – a leaf, single shoot, branch, or several branches. Yellowing and wilting move up the plant as the fungus spreads. Wilted leaves dry and drop prematurely. Interior of main stem (when split) shows discolored streaks from plugged water-conducting tissue. When does fusarium wilt affect plants? The disease can attack at any stage in a tomato plant’s growth, but symptoms are most common right after tomato blossoms appear. The fungus favors temperatures between 70º-90ºF and wet weather, which allows it to spread more easily. Plants in poorly drained soil are more susceptible to infection than those in well-drained soil. Wet soil allows the fungus to multiply and move up through the tomato plant’s water-conducting tissue. How do you control and treat it? To date, there is no chemical treatment available. To slow the disease, keep soil pH between 6.5 and 7.0 and use a nitrate-based nitrogen fertilizer rather than an ammonia-based nitrogen fertilizer. How do you prevent the fungus from infecting plants? Rotate crops. The fusarium fungus can survive indefinitely in the soil. Plant tomatoes no more than once every four years in the same spot. Avoid planting other Solanaceous crops (potato, pepper, and eggplant) in the same area, too – they are susceptible to the fungus. Choose disease-resistant tomato varieties. An “F” listed after the variety name on its label indicates its resistance to one or more strains of the fungus. Plant tomatoes in well-drained soil. Fusarium wilt is more serious when root-knot nematodes are present. They weaken the plant and allow the fungus to spread more readily.